Cap off a meeting with clients with this custom tote! With its metro look and modern functional design, this custom tote appeals to the “in” crowd! Spacious main compartment includes a dedicated 14" laptop compartment and secures with rivets. In addition, an interior padded tablet pocket keeps your iPad® tablet or e-reader safe. Side and front slash pockets give you immediate access to your phone and water bottle. 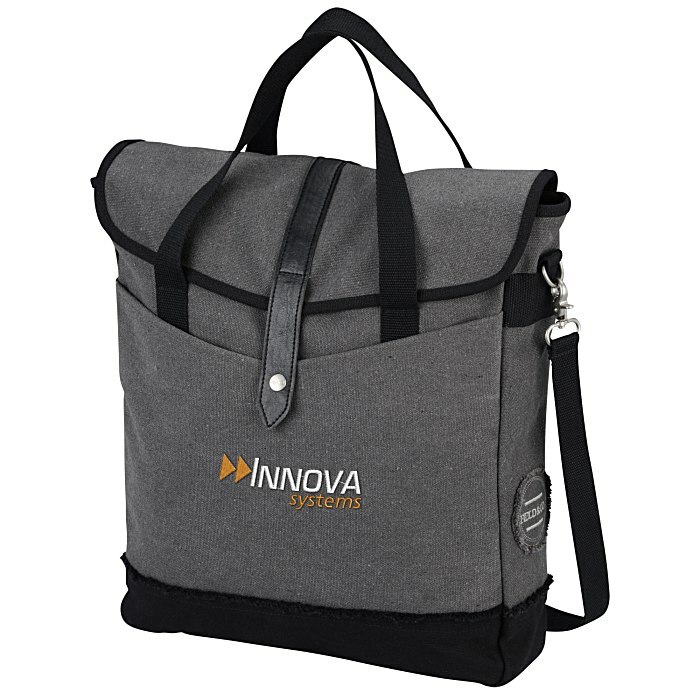 Removable, adjustable shoulder strap and carrying strap provide comfortable carrying options. What makes the bag unique is the distinctive Field & Co® branding details like the metal details, the black and white gingham lining, and the exterior cotton patch. Made of 16-oz cotton canvas with vinyl accents. Size: 14-1/2" x 13" x 3-1/4".